The classic design of the American Gold Eagle bullion coin is beautifully captured in the elegant striding Liberty motif, first created by Augustus Saint Gaudens for the 1907 Gold Double Eagle coin. The reverse depicts a nest of American eagles to symbolize the strength and security of American families. 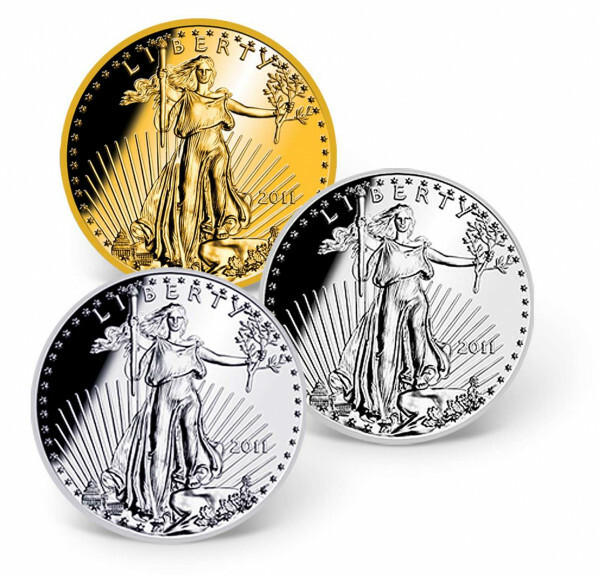 By law, only gold mined in the United States is used in the minting of American Gold Eagle coins. Since its introduction in 1986, the American Gold Eagle has become one of the world's most widely traded gold bullion coins. This magnificent set features three replicas of the American Gold Eagle bullion coin. Meticulously reproduced from Augustus Saint-Gaudens' remarkable design, each coin is exquisitely layered in a precious metal: one in 24k gold, one in .999 pure silver, and one in pure platinum! These coins are minted to the highest quality "Proof  standard and come in a beautiful wooden collector box, custom-crafted to preserve and display your precious coins for generations tocome - a true collector's item.